When your company first starts using Socialcast, it won’t seem too difficult to keep track of all the various nuggets of information you glean from participating in this giant cloud of work-related awesomeness. Then as traffic picks up, your brain is no longer able to remember it all. The good news is that Socialcast does a pretty good job of not losing anything on your behalf; it knows you need all the help you can get. And there are a few techniques you can use to maintain order among the chaos. When you know the key details, using the Search box is almost always the fastest way to go. From anywhere in Socialcast, click in the Search box at the top left. 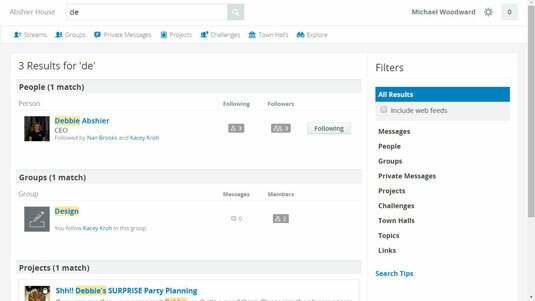 Search by people’s names, a group, #tag, keyword, or just whatever exactly you’re looking for. You can either make your selection from the options that appear as you type, or you can enter the search phrase and press Enter (or click the magnifying glass icon). If you choose the latter route, you’ll land on the Search Results page, where you’ll see a list of items Socialcast dug up based on your search. The results are sorted by type. If you have a lot of results, you can filter them by type on the right side of the screen. Just click on the type of items you want to focus on and send the others on coffee break. 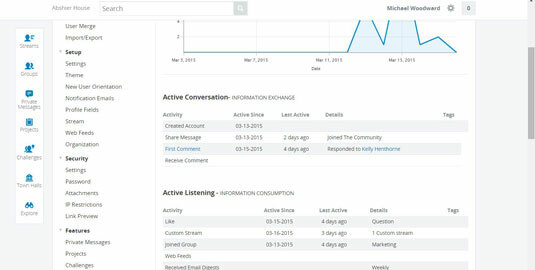 If you click on your name at the top of the page, you’ll go to your profile page, a central hub for all things “you.” Think of it as your Socialcast dashboard — you can access and monitor most everything here, including things you might be looking for like the company org chart or how many people are following you. If you’re the helpful sort, chances are you have a bunch of Thanks hanging out collecting virtual dust. Revisit your glory days with a trip to your trophy room. Whenever a file is attached to a post of any kind and it shows up in your steam somewhere, you’ll also find the file here by itself (no steams attached). Use the Sort by drop-down menu to reorder the files by name, type, or date. You can see all the groups you belong to; filter out the inactive one(s), or see just the ones you administer. There are also some sorting options on the Sort By drop-down menu. To find your many options for streamed content and conversations, hover over the Streams button on the main toolbar (which sometimes goes across the top of the browser page and sometimes down the left side, depending on the size of your window). If you hang there for a second, Socialcast will present you with a list of streams, so you can hone in on what you’re looking for. Home. This is the catch-all stream. Everything you post and everything the people you follow post, along with company-wide broadcasts, will all appear in your Home stream. Bookmarked. The Bookmarked stream gives you access to all the activities and postings that you told Socialcast to save for later when it first appeared. This is where Socialcast saves it for you! @Mentions. Any time you get @mentioned, the posting will also appear in the @Mentions stream. If you think people are talking about you, maybe they are! Sent. Just your outgoing postings. Nothing new here to see, just move along, folks. Recommended. When Socialcast gets to know you getter, it will start suggesting other posts that might interest you. Custom streams by people, group, #tag, or keyword. This is where those extra little steps you take to start and stay organized can go a long way. If you always use #hashtags consistently, you can create your own custom streams and keep everything flowing along nice and orderly. To start a new stream, just click the + symbol on the Streams menu. On the opposite end of the menu from Steams is the Explore button. You’ll recognize most of the features here if you’ve spent any time with Socialcast at all. The difference in this view is that you see everything in that category, not just your own stuff. People: Ah ha! Finally, you found the Company Directory! Everybody who is a member of your community can be found here. You can follow or unfollow them, see how many followers and followees they have. Click on their name or picture to open up their profile for details like phone and email address (if they provided it!). You’ll also see the latest in their activity stream. Unfortunately, you cannot sort by when they joined; that is definitely a missing feature. Topics: This is where you’ll find everything that has a #hashtag. You can sort them alphabetically or by most recent. On the right, you can see how many messages have been sent. And, yup, there’s Help, tucked down along the very bottom of the page. If you click on it, Socialcast will open Help, which is technically a FAQ sheet. Helpful in some situations, but inevitably, your Q might not be one so frequently Aed. Need to dig deeper? Gone are the days of 1400-page technical tomes that when not being read served best as doorstops. Scroll down to the bottom of the FAQ and click either Developers or Administrators. Both will lead you to very robust technical documentation on how to use, manage, and customize Socialcast features and communities.